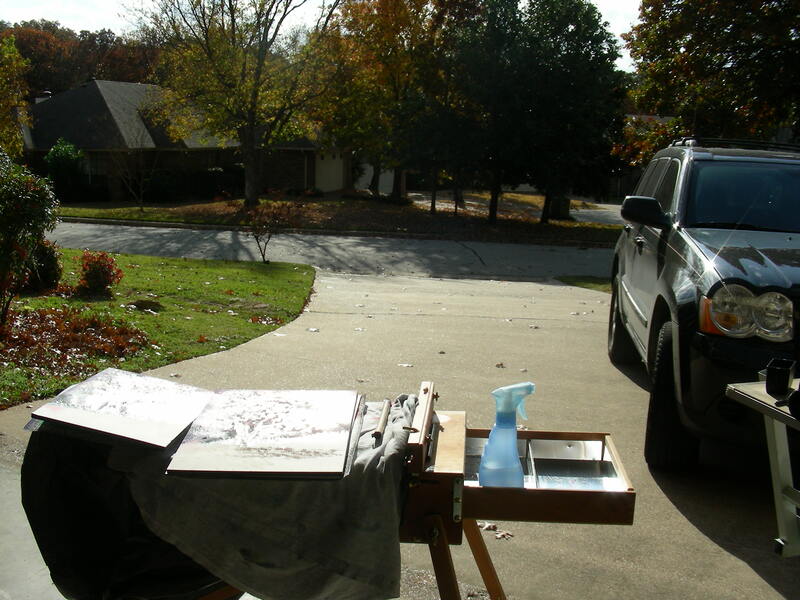 During the Thanksgiving Holidays, as the temperatures dropped and the sunlight grew stronger against the fall foliage, I got this crazy notion to set up my French easel in my garage and do some quick watercolor sketches of the neighbors’ trees across the street. Keeping warm with a thermos of coffee, I had the time of my life that afternoon as I worked on two quick sketches that involved plenty of masking and pouring of the watercolor pigments. I’m still messing with the two pieces but decided to post one of them tonight to show anyone interested how the experiment is coming along. I had a fabulous time, working like a mad scientist in his laboratory that day. I hope to do it again soon. Thanks for reading. Hopefully I will be able to post before long a new painting of my wife on her horse, along a fence line, beneath fall foliage. This is going to be another large poured piece. Saturday morning found me waking to temperatures in the upper 30’s. Sandi had a riding lesson scheduled in south Fort Worth. Since it was the first time to take her horse trailer out, I decided to come along to offer an extra set of hands for some of the details of loading a trailer and helping get the horse in and out. Once we arrived, I found the world to be extremely bright and clear with sunlight. Sandi got her horse prepped for the lesson, and I photographed her and Andante riding about the pen, stretching and loosening up. By the time her lesson appointment arrived, I looked around for something to do. These trees were “calling out” to me from the time we arrived on the property. The incredibly bright yellow and orange leaves against a dark forest just would not let go of my imagination. The sight of leaves falling between that dark space of tree cluster and bare ground also raised my ecstasy. I walked around, looking at this site from three different directions, all the time trying to talk myself out of the commitment to a plein air watercolor. I felt rusty, out-of-practice, uptight, not ready. All of this added up to the “dance of avoidance” Ian Roberts writes about in his Creative Authenticity. I knew that, like Edward Hopper and Andrew Wyeth before me, there would be rewards waiting if I would just respond to the call. But I was overwhelmed as I continually gazed at the complications–the masses of fall foliage, the dark forest behind, the bald, dirt ground beneath, the shadows spinning out from the trees and their gnarled trunks. I felt there were just too many details to chase, and I felt tired. I pulled out four unfinished watercolors, along with the 8 x 10 photographs I had taken of the subjects. Nothing moved me. I took out my digital camera and photographed the scene before me repeatedly, trying to convince myself that I could do a better job working from the photographs and inserting a grazing horse beneath the trees. I knew that I would not do that, however. Trees from photographs just don’t “do it” for me. I even contemplated reading; I had a whole bag full of books. I even thought of writing in my journal. But I knew I would live with regret if I passed on this opportunity, and Sandi’s riding lesson was going to take up an hour. 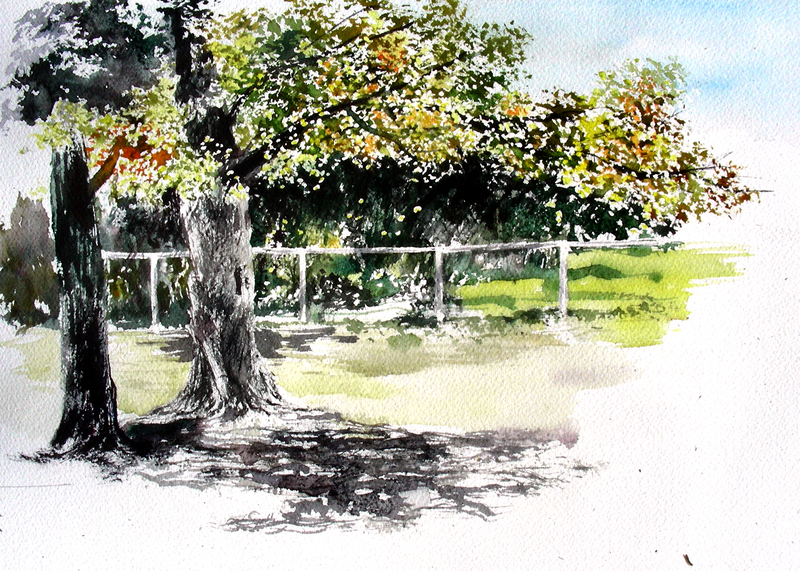 So I sat, and looked, and thought–and finally drew out my watercolor block and sketched in the tree trunks and fencing. Next I pulled the Super Nib Masquepen and began to dot in the hundreds of leaf clusters and falling leaves, along with the pipe fencing. Once everything dried, I laid in a quick Cerulean Blue sky. Fortunately the steady cold winds were drying out the surface of the watercolor block quickly. Quinachronine Yellow, Cadmium Yellow, Alizarin Crimson and Sap Green were the predominant pigments to help see me through the fall foliage. I was pleased at my overall draughtmanship on the gnarled tree trunks. I mixed plenty of Alizarin Crimson, Cadmium Red, Winsor Green and Ultramarine Blue to come up with my blacks and grays. An HB pencil also aided me in drawing in the tree bark, along with some help from an 8B Derwent watersoluble pencil. The tree trunks came together quite quickly. I felt pretty lost on the shadows across the dirt, so I used more of my black and gray mixings from the colors listed above, and swirled them about on the dry paper with my “ugly brush”–a real staple for me. My “ugly” is a flat sable that I cut diagonally and then used an X-acto knife to pull out some of the bristles, leaving a jagged chisel-looking brush for my foliage, weeds and tree bark. I’m really delighted that I responded to this opportunity, instead of passing it by. I was really taken by what Annie Dillard referred to as the “tree filled with lights.” I could not get over the beauty and splendor of the bright, bright sun reflections coming out of those brassy-colored leaves. And to think that I almost passed on this to read instead. I recall Nietzsche talking about how “positively wicked” it was for a writer or scholar to spend the prime time of the day reading–lost in other men’s thoughts–instead of producing one’s own. I’m grateful that this day was a day that I decided to create. Well, it’s the first evening of a five-day Thanksgiving Holiday. My wife and I have been sick with sinus infections for over a week, and I’ve felt too poorly to focus on painting. But once school ended today I couldn’t get to rural Burleson fast enough. This gorgeous crepe myrtle is on the property where Sandi boards her horse. I could not believe how alive it was in color as the sun began to set. This is a quick, 45-minute sketch of it. 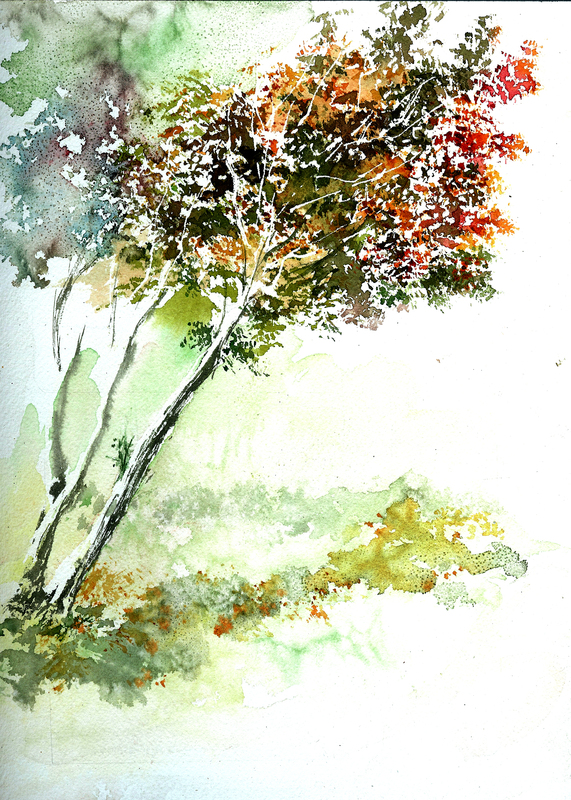 I guess Emerson called it right when he wrote that “nature wears the colors of our spirit.” This is the first day I have felt “whole” in over a week, and as I stood at my easel, taking in the beauty of this tree, I felt cleansed as I sought to reproduce these fiery colors on the paper. My own neighborhood is alive with color, and has been for over a week. It is as though nature waited patiently for me to recover from this annoying illness and muster enough stamina to paint her. 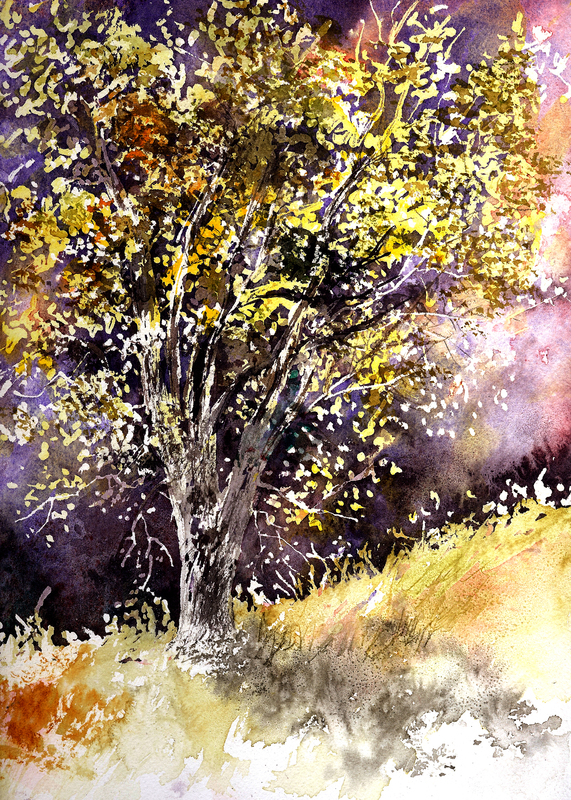 In the morning, I intend to step out into the neighborhood and do my best to capture more of this scintillating fall foliage in watercolor. I have posted similar information in another entry today, so I will try not to duplicate (much). I began this painting Saturday morning during the first of a 2-day art festival, where very few patrons were coming around the booth. Too much time on my hands, so I figured I needed to do something constructive rather than stand around. I have painted this site before. I wish I took better notes on my travels. All I know is that this structure is in New Mexico and I spent plenty of time on historic Route 66 on the day that I photographed this site. I just don’t know for sure if it was on Route 66, or on a connecting highway. I believe it is northwest of Santa Rosa. If any of you readers recognize it, perhaps you could help me. The weekend art festival was a one-hour drive for me, and I listened to CDs of Kerouac’s On the Road as I drove through the country. Thus I was prompted to paint some of those “open-country” themes. I miss the independent cafes and diners that were such an important part of our road trips in the fifties. I was saddened years ago to find that the “Owl Shanty” along Route 61 in southeast Missouri was only a concrete slab barely visible among the weeds. Most of our American roadside past is buried beneath the weeds and concrete. This particular diner looks like the kind I enjoyed in the days of my youth. When I drove past it on that particular day, and saw the gathering thunder clouds in the distance, I felt a Proust-like “recollection” of childhood moments that were profoundly important to me then, and still are. After a long weekend of delivering my art to three separate events (competition, gallery opening, and 2-day festival), I feel rather “wasted” this Monday morning. But school still beckons, I’m a teacher, and therefore I answer the bell. While at the festival, I worked on a painting each day. The one posted is what I began yesterday (Sunday) morning, and tinkered with throughout the day (patrons were very few and even further between). This is a 1950 Chevy Sedan Delivery that I have visited several times, thanks to the gracious owner of the property that allows me to “trespass.” It is parked in a field north of Highway 77 just east of Interstate 35W, north of Hillsboro, Texas. Making the one-hour drive to and from the festival each day gave me plenty of time to muse as I listened to CDs of Jack Kerouac’s On the Road, narrated by Matt Dillon. Kerouac’s work always leaves me in a contented state of mind, especially when I’m staring through the windshield of my Jeep and driving through wide-open country. I decided on that second day of the festival that I would return to this subject of the Chevy. 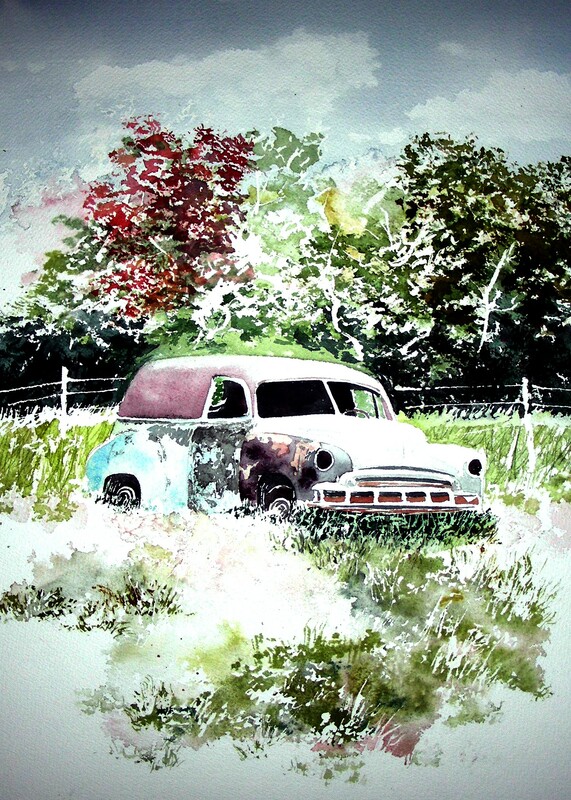 I feel “drawn in,” Proust-like, when I see a vintage car rusting in an open field somewhere (and they are getting harder to find these days). Cars from the fifties remind me of long road trips with my parents. Seated in the backseat, I could not read (carsickness), so I had to stare out the window at the American countryside scrolling across my window as it were a TV screen. I had hoped when I was younger that I would grow up to be a man with the ability to capture these American scenes either through story-telling or artist illustration. I still feel that compulsion. I’m experimenting more and more with the Masquepen when I work with tree foliage, weeds, and automobile texturing. And I’m also finding salt to be more and more fun with all the surprises it leaves behind during the drying stages of the wet-on-wet washes. With a gallery opening this coming weekend, and another art festival running at the same time, I’m in a pinch to finish some paintings. This one I abandoned a few months back. Earlier photos of it have already been posted on the blog. I am the guitar player–a friend photographed me playing at an art festival several years back. The GMC pickup is from an abandoned site somewhere in New Mexico (I remember the summer but not the town). The abandoned tavern is in Old Appleton, Missouri, alongside old Highway 61, north of Cape Girardeau. My father frequented this joint when he was a young adult. 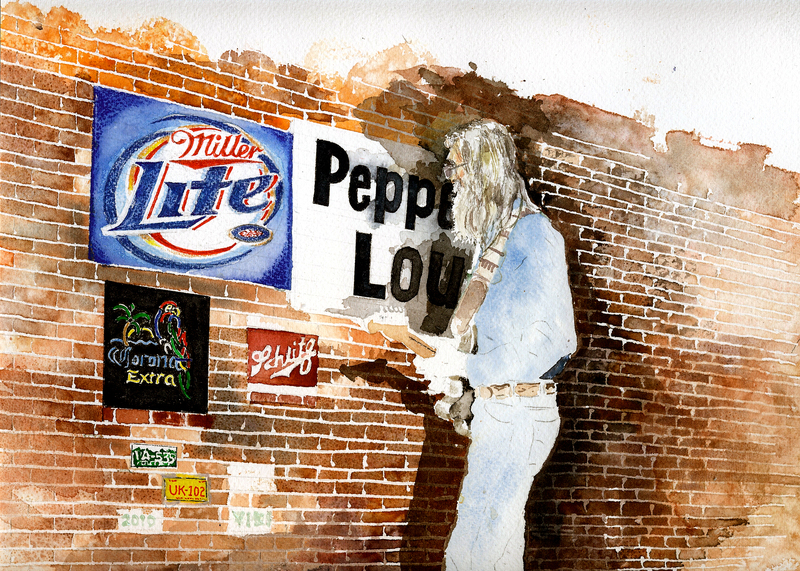 He recalls that the bar was on the ground floor, and the dance floor on the second story. I haven’t visited the site since about the year 2000, and it was in bad shape. I fear that I will return one day to find it gone, like so many other derelict character-laden structures I have painted over the years. I’m getting closer to finishing this one out. I have another gallery opening and art festival next weekend. I’m pushing hard, trying to finish watercolors in progress that have been dormant far too long. I’ve been engaged with this piece for about 3 days now. This is Zeb Cash-Lane of Arlington, Texas. 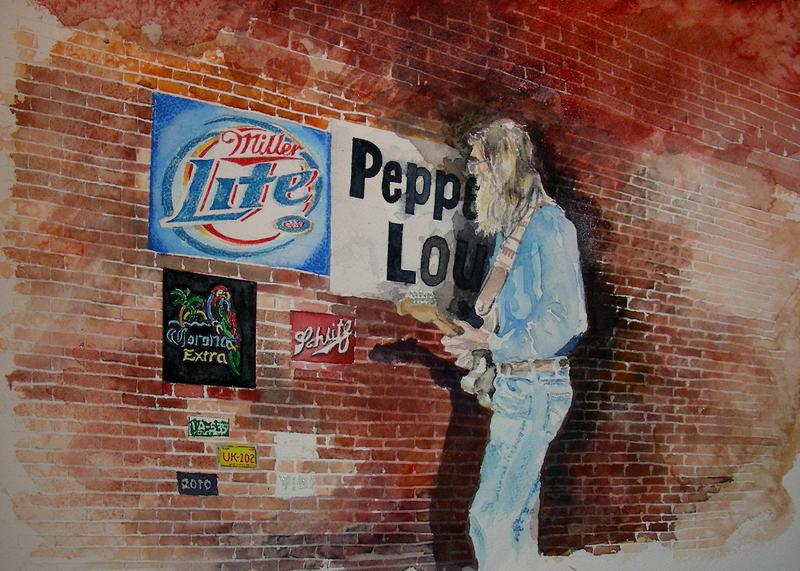 A few years back, I played in a blues band with him that did regular gigs at the Peppermill Lounge in east Fort Worth. Zeb is an outstanding electric bluesman, with a host of original songs to his credit and plenty of experience in the recording studio. Hopefully I can finish this over the weekend. I have another festival approaching in eight days, and the school schedule is becoming less flexible. 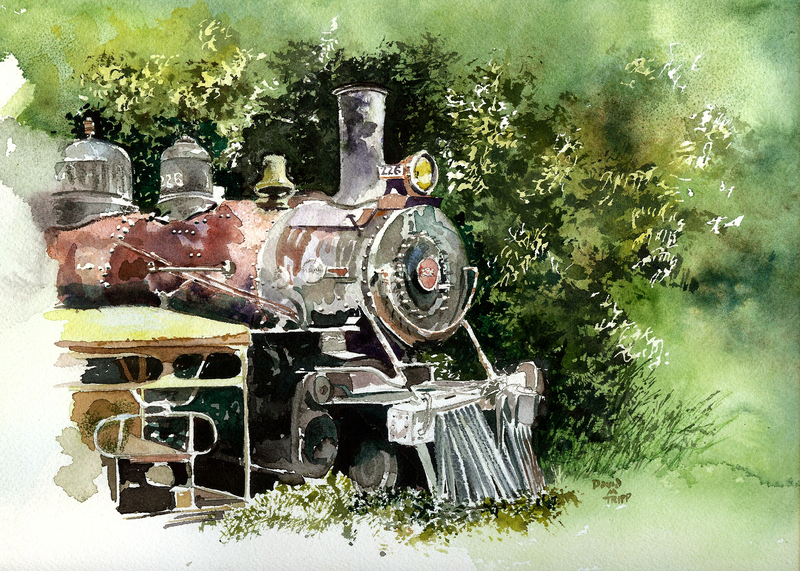 It’s getting harder to find quality time for plein air or studio work. I’m finding scattered moments of time to return to some unfinished pieces from the past. 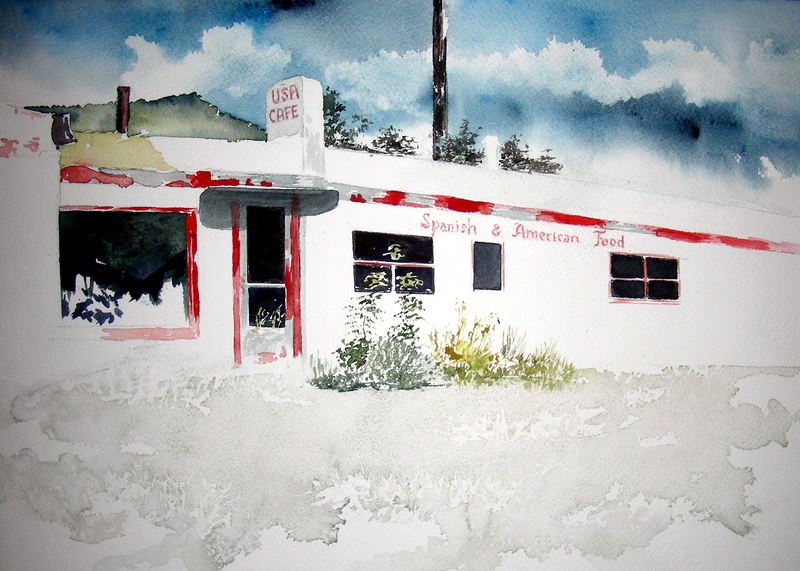 This is a watercolor I began not long after I left Eureka Springs, Arkansas last June. 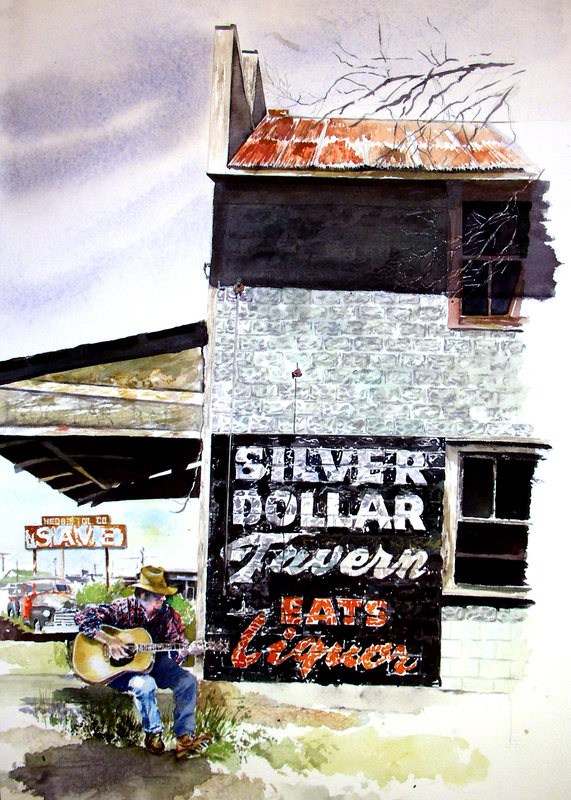 I had taken a number of photographs around the town after finishing a one-week plein air watercolor class I taught at the Eureka Springs School of the Arts. For a long time, this composition was not shaping up too well. Finally, after heightening the contrast, improvements began to happen. I feel better about it now, but am glad that it is done. It is time to move on to a number of other half-finished pieces. I always laugh when I read that Samuel Taylor Coleridge kept unfinished manuscripts littered all over his writing studio. That describes exactly how my art studio looks year-round. I start many, many works (sometimes I have as many as a dozen partially completed watercolors). Eventually, I return to them and finish them (unlike Coleridge). Thanks for reading. The hour is late, and I still have some art history to prepare for tomorrow morning (sigh).